Chronos allows you to adjust a number of formatting options and settings for many elements of your article. The Article Details options contain basic detailed information for the overall article. This tab allows you to upload a Featured Photo for the article, and include a brief summary of the article’s content. The Featured Photo you choose will be displayed in article previews, but not in the article’s header. The Article Summary is a required field and should be less than 112 characters in length. The summary will appear in the article header under the article’s title. The Article Summary is a required field and should be less than 112 characters in length. 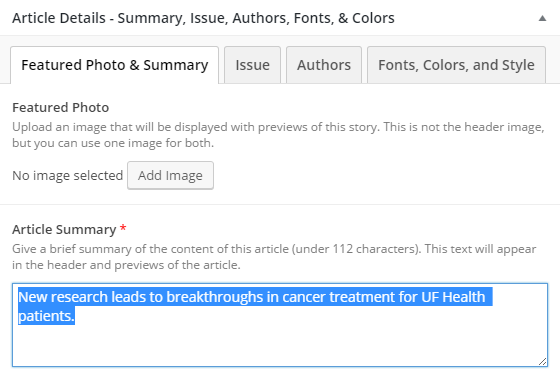 Assign your article to the Issue you want it to be included in. If the Issue has not been created yet, you can come back and assign the article to an Issue at a later time. Choose the author(s) of the article. If more than one person is listed as an author, their names will appear on the article in the order you selected them, not alphabetically. You can select a Font Combination and Color Palette unique to this article. This will override the overall publication font and color scheme settings. You can also upload a special image that can be used as a section separator.